Need to hint to your honey about the big day, or looking for a calming comfort food? 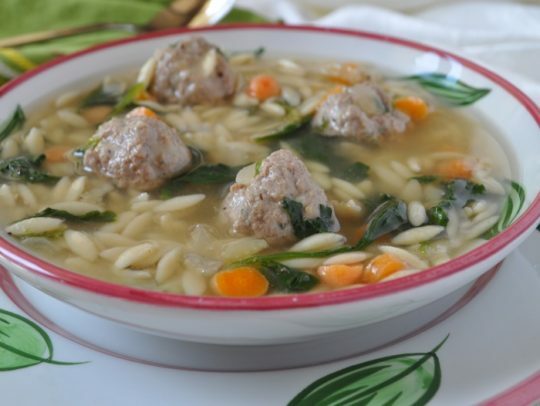 Think of this as a first-rate chicken soup with mini-meatballs and loads of flavor. Wait until you try these meatballs! In large nonstick pot coated with nonstick cooking spray, sauté onion, celery, carrots and garlic until tender, 7 minutes. Add both broths and oregano. Add orzo. Bring to boil, reduce heat, and cook 5 minutes. Add Mini Meatballs (see recipe), and continue cooking 8 minutes or until meatballs are done. Add spinach, cooking a few more minutes until wilted. Season to taste.